Finally a video with some new Filly Funtasia material! Well, it's not really that new since it was uploaded almost half a year ago, and it's not a promo - it's an interview with Toni García, creative director of Screen21. However, you can see some never before seen Filly Funtasia material in the background of the interview. Let's take a look at it! As you may notice, the answer doesn't really match the question. 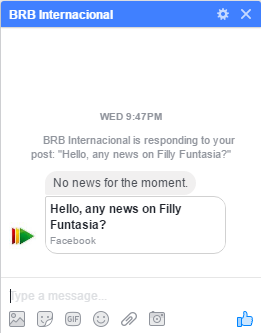 That's because this seems to be the answer they respond with to every Filly Funtasia-related question right now, according to the conversations people have shown us. It appears that this statement is all that they are willing to (or able to) give us right now, so please don't go flooding their account with questions. We've focused awfully much on the woes of the Filly Funtasia show lately. Let's take some time to talk about the Filly toyline which at this point still seems to be on track. As we've written about in our FYI series, a new major Filly toyline has been released once each year for a long time, and it's typically released quite early in the year. That means that we can expect to see a new Filly toyline in a few months time. Now, while we can't really know what exactly that toyline might be, we have a feeling that they're going to remake Filly Fairy. Let's take a look at why they might do that. It keeps happening! Last time we ran an article about BRB's removals of Filly Funtasia material, we commented that this might be the last article like that from us since they were running out of places to remove Filly Funtasia from - silly me, I had completely forgotten about their video uploads! The original uploads of Promo #1 (the original video from way back in 2013) and Promo #4 (the one they actually sent to us) are now set to private. Don't worry though, they're not gone forever, both #1 and #4 have been reuploaded on the Filly Funtasia fan channel as a response to BRB's removal. The videos are embedded at the end of the article. Princess Sparkle has come with an important message for the fans of Filly and other franchises. This particular video was made by me (Zejgar) and uploaded on my Youtube channel, which has been sporadically updated with short Filly-related content for over two years. Be sure to check it out if you like amusing Filly videos! About a week ago, we announced that we'd be holding an extended discussion, and take the opportunity to answer some of your questions. As a result of that, we present to you: "Filly Funtaudio" - an extended podcast-y discussion between Skundi (that's me!) and Zejgar. It's pretty long, so you might want to put it on in the background while you play some video games. This is the last installment in the Filly toy line sub-series of the "Fill(y)ing You In" article series. Throughout the last three entries, we looked at the primary toy lines of Filly, which have defined what the brand represents. Today, we will discuss special branches of Filly that are sprinkled over the years of its existence. The attempts at finding out what's happened to Filly Funtasia after recent events continue. Tom S Fox has been in contact with Filly Funtasia writer Jymn Magon to hear if he knows anything. Last autumn, he was in Barcelona for a meeting about Filly Funtasia, but apparently he hasn't heard from them in months now. 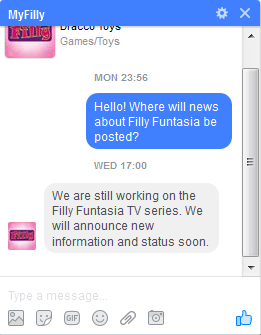 Meanwhile, BRB themselves have finally responded to one of many messages sent to them about Filly Funtasia - albeit with an answer that only revealed that they seemingly really don't want to reveal anything about Filly Funtasia right now. I'd like to thank Tom S. Fox and our anonymous Facebooker for sending this in. If you have been in contact with anyone about Filly Funtasia's fate or if you know anything we don't, please send it in to [email protected]. Even if it's bad news. 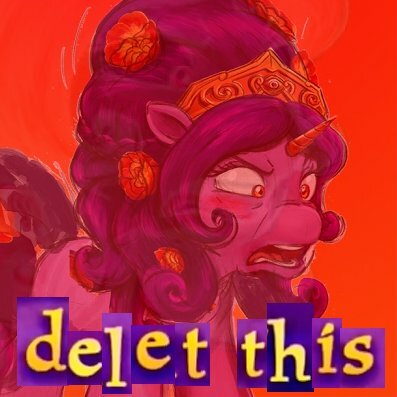 At this point, I'd prefer being told that the worst has happened to Filly Funtasia remaining vaporware forever. It keeps happening! As we've previously reported on, there was no Filly Funtasia at this year's MIPCOM, which was revealed to us at about the same time that Filly Funtasia was removed from the overview on Apolo Films' website and the Filly Funtasia info page on BRB's website was made inaccessible. Well, Filly Funtasia has now been removed from a few more parts of BRB's website since we wrote that article. Let's take a look. Welcome to another entry in the toy line sub-series of the Fill(y)ing You In series! This article will touch on the three latest primary Filly toy lines: these lines came to be after Filly Funtasia was already announced, and after the creation of this very website. Judging by the rate of their appearance, in early 2017 there is going to be yet another new toy line, which will get its own separate article (or articles) - but for now, let us marvel at what currently are the remaining modern Filly toy lines.